Have you heard about deep water culture for plants? It’s also referred to as hydroponics. Maybe you have a gist of what it is and how it can be used but really, what is deep water hydroponics? Is it possible to build a deep water culture system of your own? What is Deep Water Hydroponics? As mentioned, deep water culture for plants (DWC) is also called hydroponics. Simply put, it is a method for growing plants without a substrate media. The roots of the plants are encased in a net pot or grow cup that is suspended from a lid with roots dangling in a liquid nutrient solutions. The deep water culture nutrients are high in oxygen, but how? Oxygen is pumped into the reservoir through an air pump and then pushed through an air stone. The oxygen allows the plant to uptake the maximum amount of nutrition, resulting in accelerated, prolific plant growth. The air pump is crucial to the entire process. It must be on 24 hours a day or the roots will suffer. Once the plant has established a robust root system, the amount of water is lowered in the reservoir, often a bucket. The upside to DWC, as mentioned, is the accelerated growth resulting from superior uptake of nutrients and oxygen. Aerating the roots improves water absorption as well resulting in improved cell growth within the plants. Also, there is no need for much fertilizer because the plants are suspended in the deep water culture nutrients. Lastly, DWC hydroponics systems are simple in their design and require little maintenance. There are no nozzles, feeder lines or water pumps to clog. Interested? Then I bet you wonder if you could build a deep water culture system of your own. Before we look at a DIY hydroponic deep water culture system, we should consider the disadvantages. First of all, the water temperature is difficult to maintain if you are using a non-recirculating DWC system; the water tends to get too hot. Also, if the air pump goes kaput, there is a very small window for replacing it. If left without a viable air pump for too long, the plants will rapidly decline. The pH and nutrient levels can vary a great deal. Therefore, in multiple bucket systems, each must be tested individually. All in all though, the benefits greatly outweigh any negative factors and, really, any type of gardening requires maintenance. A DIY hydroponic DWC is very easy to design. 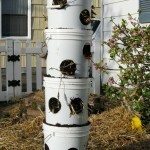 All you need is a 3 ½ gallon bucket, 10-inch net pot, an air pump, air tubing, an air stone, some rockwool, and some expanding clay growing medium or the growing media of your choice. All of this can be found at the local hydroponics or gardening supply store or online. Begin by filling the reservoir (bucket) with hydroponic nutrient solution at a level that is just above the base of the net pot. Connect the air tubing to the air stone and place it in the bucket. Place your plant with visible roots growing out of the rockwool into the reservoir. Surround the plant with either your choice of growing medium or the aforementioned expanded clay pellets. Turn on the air pump. Initially, when the plant is still young, the rockwool needs to be in contact with the nutrient solution so it can wick the nutrients and water up to the plant. As the plant matures, the root system will grow and the level of the nutrient solution can be reduced. Every 1-2 weeks, remove the plant from the bucket and replace and refresh the hydroponic nutrient solution, then place the plant back in the bucket. You can add more buckets to the system, ergo more plants. If you add many buckets, you may need to add or upgrade the air pump.